You'll find plenty of places to visit near New Delhi: Gurugram (Gurgaon) (Sai Ka Angan Temple, Cyber Hub, & more). 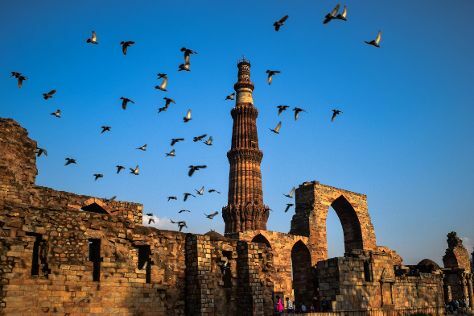 There's much more to do: make a trip to Humayun's Tomb, take in the spiritual surroundings of Bahai Lotus Temple, contemplate the long history of Gandhi Smriti, and admire the natural beauty at Lodi Gardens. To see maps and more tourist information, go to the New Delhi driving holiday planner . Guadalajara, Mexico to New Delhi is an approximately 26-hour flight. You can also do a combination of bus and flight; or do a combination of flight and train. The time zone difference when traveling from Guadalajara to New Delhi is 11 hours. December in New Delhi sees daily highs of 27°C and lows of 10°C at night. Finish up your sightseeing early on the 8th (Tue) so you can travel to Mexico City. Explore the numerous day-trip ideas around Mexico City: Zona Arqueologica Teotihuacan (in San Juan Teotihuacan) and Cuernavaca (Robert Brady Museum, Spanish Language Institute - Day Course, & more). There's still lots to do: see the interesting displays at National Museum of Anthropology (Museo Nacional de Antropologia), appreciate the extensive heritage of Historic Center (Centro Historico), admire the masterpieces at Palacio de Bellas Artes, and explore the ancient world of Museo del Templo Mayor. To see traveler tips, reviews, photos, and tourist information, go to the Mexico City travel route planner . Fly from New Delhi to Mexico City in 23.5 hours. The time zone difference when traveling from New Delhi to Mexico City is minus 11 hours. In January, daytime highs in Mexico City are 24°C, while nighttime lows are 7°C. Finish your sightseeing early on the 20th (Sun) so you can travel back home.